Pristine Cleaning Cincinnati, Dayton, Columbus, Commercial Cleaning Services | We Clean It All! pH is how you measure acidity and alkalinity of a solution. Basically if a cleaning solution you are using has a low pH number then it has a higher concentration of acidity in it. If the pH value of a chemical you are using has a higher number then it has a higher alkalinity to it. 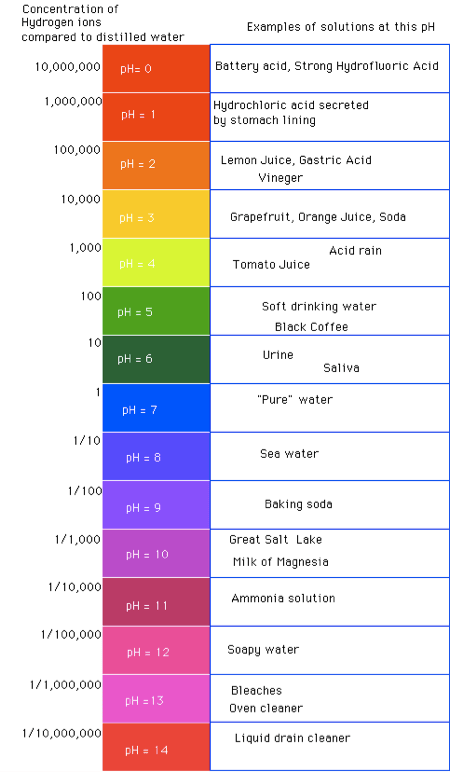 The pH scale consists of numbers from 0-14 with 7 being neutral. 1-4 is higher in acidity while 5-7 is neutral and 8-14 is alkaline. Here is a better way to look at it. You can see why understanding pH balances is important. You would not want to use a high acid cleaner on a laminate counter top because it can discolor the surface. While if you use a high alkaline product you can get a hazy look if you do not rinse the surface thoroughly. The best product to use for everyday cleaning is a neutral disinfectant, designed for multiple surfaces. Now there will be times that a standard neutral disinfectant will not remove that stubborn grease on the lasagna pan. That is why you would need to look into a chemical that has more powerful surfactants in them. I will explain about using surfactants on my next blog. Josh Reffitt has over 15 years of facility and custodial knowledge with in depth knowledge of school and commercial custodial services. He has a degree from Miami University in Business Management Technology and multiple certifications including Project Management Professional (PMP), Certified Associate in Project Management (CAPM), Quality Assurance Officer (QAO). He also possess multiple certifications in equipment and chemical usage. He has a history for being well known for improving methods in the custodial industry, facility repairs and many more. Josh has helped many businesses achieve cost-saving measures by reducing staff, product, and educating their employees in better techniques of safety and cleaning processes and procedures. Receive our blog posts in your Inbox. Subscribe Below. Tired Of That Grout Looking So Dingy? Pet Urine Causing You A Stink? Pristine Cleaning © 2019. All Rights Reserved.